Are your weight issues due to insulin resistance? Have you ever felt sluggish, are hungry a good part of the day, and nothing you do makes a difference? Have you tried multiple diets, exercise programs, lose-weight-quick gimmicks and are just fed up? You may be insulin resistant. Insulin resistance makes it very difficult to lose weight, and very easy to gain weight. New research shows that if you have more lean muscle tissue, you have less risk of insulin resistance. Insulin resistance – or pre-diabetes – is associated with a sedentary lifestyle and a diet high in processed refined carbohydrates and sugars. The cells of your body aren’t metabolizing glucose properly, and when this becomes advanced, it leads to full blown diabetes. With the prevalence of diabetes doubling in the past 15 years, it makes sense to try and avoid becoming one of those statistics. What can you do if you think you are insulin resistant and want to avoid diabetes as well as lose weight and increase your energy? A proper diet is very effective at calming the system down, and can be achieved by eating single-ingredients, nutritionally-rich meals, and by avoiding fast food and processed food items like chips, pretzels and cereals. Instead, base your diet around lean proteins (like chicken, fish, and eggs), complex carbohyrdates (like brown rice, sweet potatoes and oats) and healthy fats (like nuts/seed, coconut oil and avocado). A study looked at 13,600 people and followed them for 6 years. Researchers found that people who had just 10% greater amount of muscle tissue in their body, had 12% less chance of developing pre-diabetes or diabetes type II. This would be the equivalent of a woman who is 5’4” weighing 130 pounds putting on 5 pounds of muscle tissue and losing 5 pounds of fat tissue. Her weight would remain 130 pounds, but the exchange of weight and re-distribution of her body composition would drastically reduce her risk of developing insulin resistance or diabetes. While cardio is important for your health, strength-bearing exercises are essential. Adding lean muscle can reduce your risk of insulin resistance by 12%. 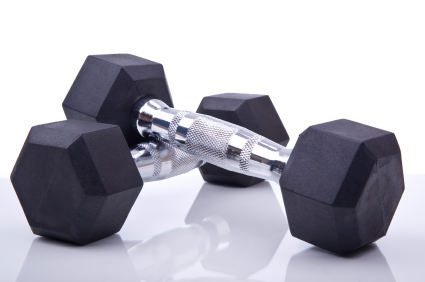 Try exercises like lifting weights, kettle bells, or using gym equipment that provides the right amount of resistance to build muscle tissue. Building more muscle tissue also helps reduce your risk of diabetes, heart disease, high blood pressure, and even certain cancers. Muscle is the major site of glucose (sugar) disposal. Inactive muscle is not as sensitive to insulin. Weight lifting literally opens up the flood gates of the cells and allows the glucose or sugar to get in. The BEST part about building lean muscle tissue? It "Tones" any area of your body with wiggle or jiggle! Never sacrifice muscle tissue during the fat loss process. Instead, build more muscle to burn more fat calories. Lifting Weights (resistance training) will not only increase your metabolic rate, it will lift, tone and shape your body, and lead to quicker fat loss because muscle BURNS FAT! You will lose fat quicker and be more successful at keeping it off. Did you know that muscle burns fat? Lot’s of fat, in fact. It takes about 10 calories a day just to keep one pound of muscle alive. How awesome is it to burn calories just by building curvy muscle! Plus, lifting weights will only make you smaller, not bigger, because increasing your body’s lean muscle mass will burn up fat over your entire body. Your metabolism also increases as you increase the amount of lean muscle your body has. The average female loses 5% of muscle per decade after the age of thirty. This causes an average weight gain of 2.2 pounds per year. Women over the age of 40 can lose muscle twice as fast as inactive men do. Because women don’t have enough testosterone to retain muscle the way men do, continued strength training becomes that much more important. As you age, without exercise, your metabolism dips and your body becomes soft due to a loss of muscle.